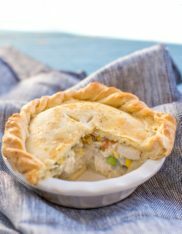 Growing up, I had always heard about Chicken Pot Pie but never tried it. It was definitely not something my mom was going to make and we never thought to buy a frozen version. My husband, on the other hand, apparently dreams of things like Chicken Pot Pie. So about 5 years ago he asked me if I could make it. Sure! I was eager to make it for my semi-new hubby even though I had never even tried it before. I was blown away. So simple, yet SO GOOD. I think there’s something to be said for making your own pie crust because this Ina Garten recipe literally tastes like a biscuit. But the filling is also subtle yet very fresh and flavorful. Clearly, this dish is somewhat of an indulgence but during the winter months it’s a must in our house. I like to make the filling in bulk and freeze it since it can be a bit time consuming. Then when we’re in the mood, all I need to throw together is the pie dough. This year I took it up a notch and made individual Chicken Pot Pies because – yes, everything mini is better. For starters, it’s immediate portion control and since it’s a single serving size you don’t have to worry about the filling being messy and running out of the large pie. Either way, however, big or small – this pie is worth making. Your loved ones will thank you. *This filling yields enough for two large pies (or 8 mini pies) - usually, I make one recipe of filling and freeze half of it in a tupperware for another time. If you're planning on making 2 regular pies (or 8 individual pies), double the following Pie Dough recipe. Drizzle olive oil over the chicken breasts and season with salt and pepper. Place them on a baking sheet and bake in the oven at 350°F for 30-35 minutes or until fully cooked. 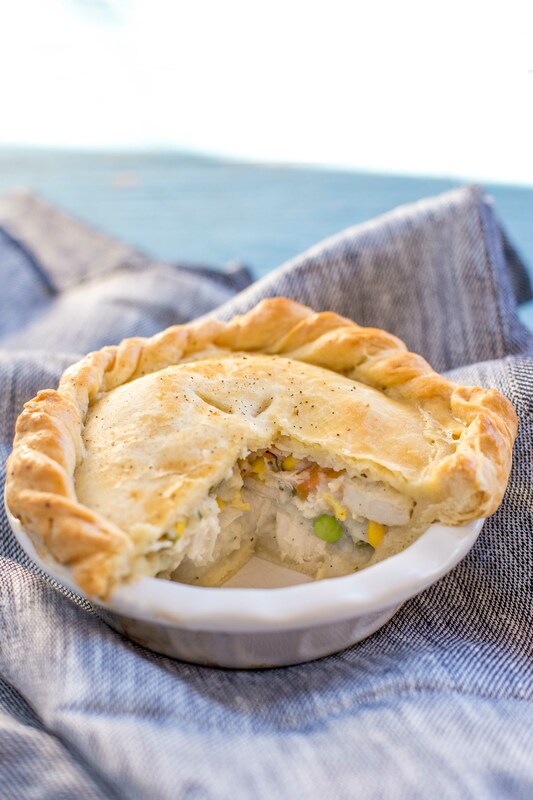 While the chicken is cooking, prepare the pie crust if you’re planning on making it yourself (see below). Once the chicken is cooked, cut it into bite-size cubes. Parboil the potato and then cube it - leave the water in the pot and keep the heat on for the mixed veggies. In the same pot, blanch the mixed veggies and pearl onions (if the onions are fresh, boil them for 2-3 minutes with the skin on; then remove the onions, cut the root and the onion should just pop out of the skin) - put the prepared veggies aside. In a small saucepan, heat the chicken broth and bouillon cube. In a large pot or saute pan with high sides, melt the butter and saute the onions and whole garlic cloves. Remove the garlic cloves once they’ve become very fragrant and saute the onions over medium-low heat until they’re translucent. And the flour while stirring the mixture constantly over low heat – approximately 2 mins. Add the hot chicken broth to the flour mixture and whisk over low heat for another minute or until it thickens. Add 2 tsp salt and 1/2 tsp of pepper and the heavy cream – continue to stir. Add in the cubed chicken, mixed vegetables, potatoes, pearl onions, parsley and thyme – stir the mixture well. Mix the flour, salt and baking powder in the bowl of a food processor fitted with a metal blade. Toss in the shortening and butter and coat them with the flour. Pulse 10 times or until the shortening and butter are about the size of peas. While the food processor is running, pour in the ice cold water. Process until the dough is moistened and is beginning to clump together. Place the dough onto a floured surface and form it into a ball. Wrap the dough with plastic wrap and place in the refrigerator for at least 30 mins. 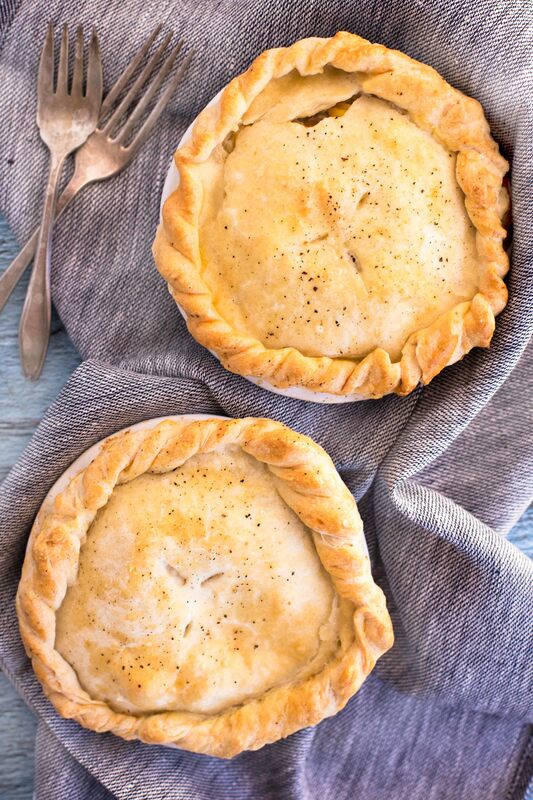 The filling will be enough to make 2 large pies or 8 individual pies – so either freeze half of the filling for another time or double the pie dough. For one large pie, cut the dough ball in half and roll it out into a circle on a lightly floured surface. If making minis, divide the ball of dough into 4 equal parts and then halve that ball of dough and roll it out into a circle. Drape the dough over the pie dish and press it down against the dish with your fingertips. Fill the pie with the chicken filling. Roll out the other half of the dough into a circle on a lightly floured surface. Brush the dough with the egg wash and make 3 slits on the top. Bake at 375°F for 1 hour or until the crust is golden brown and the filling is bubbly – you may want to cover it for part of the time, just check on it while it’s baking to see if it’s getting too brown. Pie crust recipe by Ina Garten.